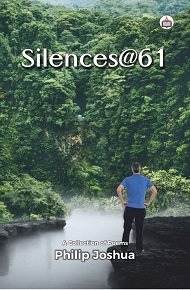 Silences @ 61 is the first collection of poems of Philip Joshua after he completed 61 years of age. He has dealt with several topics, viz. self, family, nature, various sections of society, festive and celebratory occasions, and issues concerning humanity at large. His yearnings for harmony, peace and happiness for all are expressed in a sincere manner. The language is simple and the poems are reflective. Mr. Joshua leads the reader to some familiar entities that one encounters in the outer world and lets the reader into his inner world of memories based on his varied experiences. The poet Philip Joshua was born in 1957 in the state of erstwhile Andhra Pradesh, India. After schooling in Hyderabad, he completed his B.Sc. Degree from Osmania University, Hyderabad in 1977. Later, he took his Post-Graduate Diplomain Communicationsin 1994, with a Gold Medal from Bhavan’s College, Hyderabad. He had a long stintfor more than a decade in Kuwait on professional engagements.On his return to India, he got associated with Mediciti Hospitals and later with Karvy Consultants in the Corporate Communications Departments till about 2006. After that, he joined NCC Limited (formerly Nagarjuna Construction Company Limited ), Hyderabad and is now Head of its Corporate Communications Department. His interests include photography, freelance writing, and social activism.He is committed to writing poetry in his spare time. The poet lives at 38-A, Bansilalpet, Secunderabad, Telangana state.His Email address is: philip1957@gmail.com and can be reached at Ph.No. :+918978882822.